Perhaps the easiest way to use and enjoy herbs is to make herbal tea. Herbal tea (sometimes referred to as "tisane" because the term "tea" used to be reserved for beverages made from a specific plant, Camellia sinensis) can be made from the leaves, flowers, seeds or even the roots of herbs, whether freshly picked or dried and stored for the off-season. Whatever herb you choose, the process is simple: pour boiling water over crushed herbs and let steep. Okay, maybe brewing a great cup of tea takes a bit more finesse. For that, read up on tea brewing essentials. However growing herbs for tea is one of the easiest things you can do in the garden. You don't even need a designated herbal tea garden. Most tea gardens are places to enjoy a cup of tea, not grow one. You can grow and harvest herbs for tea from any of your existing gardens. Fennel grown in the vegetable garden will brew just as flavorful as fennel grown in a pot on the front steps. Most fresh herbs are at their peak just before they bloom. However many have edible flowers that not only taste great in tea, they add a little surprise. Try not to tear or crush the herbs until you are ready to use them. You don't want to waste any of the essential oils. Of course, flavor is a personal thing. You may like your tea stronger or weaker than the average person. Flavor also depends on the quality and freshness of the herbs, so have fun and experiment. Just remember the old saying, "You can always add more, but you can't add less.". Don't be afraid to mix and combine herbs. If the scents mingle well, the flavors probably will too. The longer you steep your herbs, the stronger the flavor will be. However sometimes long steeping makes the tea bitter, so experiment and figure out when your tea is just the way you like it. There are no strict tea brewing rules. 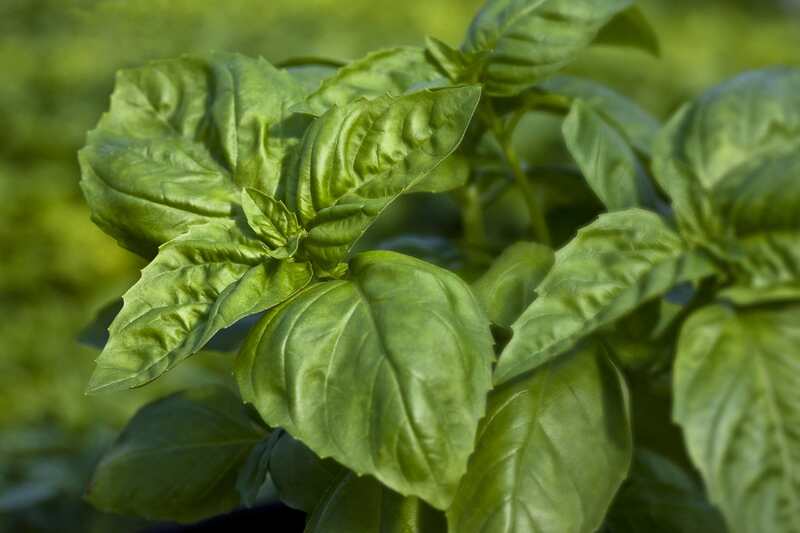 Basil has a fresh, bracing flavor that makes a clean, refreshing tea. Use fresh leaves, rather than dried. For a cup of tea, you will only need a couple of leaves, depending on their size. You can always add more to taste. Chamomile tea is made from the daisy-like flowers of the German chamomile plant. It has a fruit, apple flavor and has long been used for treating all kinds ailments and especially as a calming respite after a busy day. (It's even known for controlling damping off disease in plants.) You can use fresh or dried flowers and you'll need a teaspoon or two for every cup of tea. Fennel has a bright, licorice flavor that warms and soothes you. In any form, fennel is supposed to be good for the digestion. You can use crushed seeds or leaves, to make tea. You'll need about a teaspoon of seeds or several fronds per cup. This tea is as aromatic as it is flavorful. Lavender has an intoxicating floral aroma that permeates the whole room when you make tea. The scent is thought to relax and relieve insomnia, so it's a great tea for the evening. Use the flower buds, to make tea. You'll need a teaspoon or more per cup, per taste. Let it steep for 5 minutes or more, to really release its perfume. Lemon balm is in the mint family, so you get the sharpness of citrus with the cooling of mint. And since it is in the mint family, it grows in abundance. Fresh leaves work best, but you can use dried leaves, for a more herbal flavor. you will need about a 1/4 of packed leaves per cup of tea. Tear them, before seeping, for the fullest flavor. Lemon verbena has one of the truest, strongest lemon fragrance of all the lemon-scented herbs. Hot or cold, it makes a zesty tea that is touted to have all kinds of beneficial effects on the body, from helping digestion to alleviating cold symptoms, to easing aches and pains. Whether or not it does this for you, it is still a refreshing drink. Mint is a natural for making tea. The scent and flavor are both invigorating. Don't stop with just peppermint or spearmint. There are mints in just about every flavor you can think of: rose, chocolate, orange... The fresh leaves will yield the most flavor, but mints hold on to both their scent and flavor when dried, better than most herbs do. Start with just a few leaves and adjust to taste. Monarda goes by a lot of names: bee balm, bergamot, oswego tea, to name a few. It is in the mint family, so it grows quite aggressively. The flavor of monarda tea is somewhat stronger and more herbal than mint tea. Start by using only a few leaves, fresh or dried. You can also use the flowers, which are edible. The beautiful red seed pods of roses remind you that roses are closely related to apples and crabapples. These seed pods are called hips and they make a fruity, floral tea. Just crush one or two hips and steep in boiling water. You may need to get your body used to drinking rose hip tea, as it can have mild diuretic and laxative properties. Rosemary has both a strong fragrance and a strong flavor. A little goes a long way. It makes an invigorating, pungent tea, using either fresh or dry leaves. You will need about a teaspoon of leaves, for each cup of tea. If the leaves are crushed, you may need less. It won't take long to steep and you can cut the strong tannin flavor with a sweetener. Sage has a pleasant grassy-herbal flavor that offers many health benefits. The tea is a great stress reliever. You can use either fresh or dried leaves (2 teaspoons fresh or 1 teaspoon dried per cup.) For a fruity twist, try making tea with pineapple sage (Salvia elegan).